INDIANAPOLIS -- This year's Annual Continuing Legal Education (CLE) Program by Indiana University Law School-Indianapolis features a host of experts from academia as well as the public and private sectors who will convene on Oct. 12 at the law school to focus on "Confronting Change in a New Healthcare Economy: Patents, Antitrust and the Workplace." The IU School of Law-Indianapolis will present its annual Continuing Legal Education Program on Oct. 12. Presenters will include Eli Lilly & Company Senior Vice President Robert Armitage, who recently was chosen by The American Lawyer as one of the 25 most influential people in Intellectual Property Law. He will discuss patent reform legislation. June Im, counsel at the Federal Trade Commission, will focus on pharmaceutical patents and antitrust law from a Washington perspective, while Tom Barnett, a partner at Covington & Burling in Washington, will present a view from the bar, with a particular emphasis on issues relating to manufacturers of generic pharmaceutical products. IU School of Law-Indianapolis professors Max Huffman and Emily Morris will present a version of an article they are co-authoring in the presentation "A Patent Policy Approach to Hatch Waxman Gaming." Indianapolis attorney Ellen Boshkoff, a partner at Baker & Daniels, will add an employment law perspective when she talks about issues relating to outsourcing. The CLE program also includes one hour of ethics credit in the form of a "Professional Responsibility Update" presented by G. Michael Witte, Indiana Disciplinary Commission executive secretary, and IU School of Law-Indianapolis Professor María Pabón López . The all-day program costs $250.00 for 6.0 hours of Indiana CLE credit and includes lunch. This year's lunch is sponsored by Ice Miller LLP who is underwriting this event as part of the firm's centennial celebration. Proceeds from this annual event are awarded as scholarships to students at the law school. These programs have raised more than $130,000 in scholarship funds since the Fall of 2001. 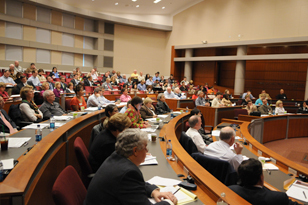 See the law school's website for a complete agenda and online registration: http://indylaw.indiana.edu/news/events.cfm?eid=359. The law school is located at Indiana University-Purdue University Indianapolis, in Inlow Hall, 530 W. New York St.
With an enrollment of more than 1,000 students, IU School of Law-Indianapolis is the largest law school in the state of Indiana. Occupying a spacious, new, technologically advanced building, the school is located in the heart of downtown Indianapolis. The school has enjoyed great success for more than 100 years in preparing students for legal careers. The success of the school is evident by the prominent positions graduates have obtained in the judiciary and other branches of government, business, positions of civic leadership and law practice. The school's nearly 10,000 alumni are located in every state in the nation and several foreign countries. More information about the law school is available at indylaw.indiana.edu. For more information, contact Elizabeth Allington at 317-278-3038 or eallingt@iupui.edu.